Twice a year I post a list of book recommendations. I know some of you fine people out there are book nerds, just like me. We reading nerds have to stick together, right! Click here for the list from last Summer, and here for the list from last Winter. Check out the comment sections of both of these posts for more book recommendations. I am also giving away a $50 Amazon Gift Card to one of you lucky readers. To enter the giveaway just leave me a comment below telling me what one of your favorite books is. Giveaway will be open until Sunday June 30th at midnight. Winner will be announced and contacted on Monday July 1st. Good luck! On to this summers list! The Secret Keeper by Kate Morton is one of the best books I have read this year. I loved the writing style, which is both elegant and captivating. Kate Morton tells the most amazing stories! Throughout the whole book I kept trying to guess the ending…never could I have dreamed it would finish as it did. I loved it, best Kate Morton book so far. The Baker’s Daughter is a story about a family living in Germany during WWII and the sacrifices they make to survive. It covers a lot of issues I haven’t read about before. Though it is sad, it’s very well written and the heroine is so endearing. Poisonwood Bible is a story of an American minister and his family who move to the African Congo to during the 1960s and 70s. The story is told through the eyes of each of the children and the mother, which gives it a wide variety of perspective. It was so interesting to see how each of the characters developed and behaved, though many of their experiences were the same. It is a compelling look into human nature. BOOK OF A THOUSAND DAYS by Shannon Hale is a Young Adult book about a princess who gets locked in a tower with only one servant and supplies. It’s about loyalty, and a little bit about love. 🙂 It’s a quick, clean read, as is the case with all of Hale’s books. She’s a great author for teenage girls. (And for Mom’s who have teenage girls and like a quick, clean read now and then). 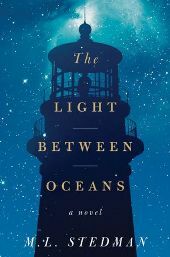 The Light Between Oceans is one of those books I cried my ever lovin’ face off while I read it. Not the WHOLE time (thank you for your concern), but certainly at the end. It’s about a young married couple who live alone on a small island and take care of a lighthouse. It’s about marriage, sacrifice and motherly love. It is beautifully written and very compelling. The Giver is a book that I’m sure many of you (and your children!) have heard of. While it’s written for a young audience, I found it to be both thought-provoking and captivating. It’s about a boy living in a post apocalyptic world, and the choices he faces in a world very different from our own. A Monster Calls is a sad tale of boy whose mother is dying of cancer. It’s about life, death and letting go. Left to Tell: Discovering God Amidst the Rwandan Holocaust is a life changing book. It’s a true story written by a woman who lived through the Rwandan Holocaust. It’s about forgiveness and love. Escape is a true story written by Carolyn Jessop, a woman who escaped a life of forced polygamy. I was stunned, truly to learn of the terrible conditions that girls and women are forced to live with in these cult-like, fundamentalist communities. It is very eye opening. On Little Wings by Regina Sirois. A beauty of a book by a beauty of an author! I love anything by Nicholas Sparks! Not sure I can pick a favorite one of his! Although not my absolute favorite, I just finished reading Paula McClain’s The Paris Wife. I’m still walking around in a bit of a daze wishing I was still reading about Jazz Age Paris. The Papa’s Wife books by Thyra Ferre Bjorn. Love them. I love the Shannon Hale books. I just finished the follow-up to Princess Academy, Palace of Stone. They are delightful, clean, fun reads. I’m happy to have my duaghters’ read them–I love the strong female characters. Also, I read the Wednesday Wars and Okay For Now by Gary Schmidt at your suggestion–I recommended them for our family book group and even my grumpy father loved the characters and story. Eyes of the Tailless Animals:Prison Memoires of a North Korean Woman by Sun-ok Yi. Amazing and very disturbing account of life in a prison camp in North Korea. Not fun to read but something the world needs to know about. Thank you for the generous giveaway. My favorite of your list is Shannon Hale’s ‘Book of a Thousand Days’. Love that story! I really enjoyed She Walks in Beauty by Siri Mitchell. I have enjoyed The Hobbit and The Lord of the Rings by J.R.R. Tolkien, The Pillars of the Earth by Ken Follett and a lot of the Nora Roberts books. Thanks for the giveaway. There are so many books that I have read. I love any fantasy book, especially renaisannce or anything in that genre. I absolutely LOVED the Hunger Games series. I’m still hunting for the perfect book though. I love “The Blue Castle” by L.M. Montgomery. Such a classic. My favorite book…I’ll pick the one that has my absolute favorite book hero. “The Bronze Horseman” by Paullina Simons. This book made me cry, and it made me laugh…and it was just all-around fabulous. One of my very favorites is “These is My Words” by Nancy E Turner. Wonderful book. I really liked “The Giver” also, so I was excited to see that on your list. Thanks for sharing! I’m looking forward to some new reads. In the middle of the Ascendance trilogy by Jennifer A. Nielsen and am loving it. I read The Secret Keeper and The Baker’s Daughter, and I LOVED The Bungalow. Great list. My most recent favorite is the Sisterhood, by Helen Bryan. I just finished Gone Girl by Gillian Flynn. It’s the 1st I’ve read of this author (I read it with some gals I work with in a club). It’s hard to put down, and I kept wanting to skip to the end and read the last chapter. It has some “yucky” language but is a good summer read. My favorite book of all time is “To Kill a Mockingbird”. I still go back and read it periodically. I love the #1 Ladies Detective Agency series. I love Afternoons with Emily by Rose MacMurray. Such a good book to get lost in! I recently read “Code Verity”, it is an amazing book about friendship, WWII, and women’s roles during the war. I am often hesitate to recommend books to people because we don’t always like the same genre but this book I will always recommend. It doesn’t end flat either like some books. I like Jane Eyre. I have it and read it from time to time…a great classic novel. I really appreciate all of your book recommendations…they are often the next books I request from the library. I can never decide on one favorite book of all time, but three books that I have enjoyed immensely are: Gone With the Wind, The Book Thief and Heaven is Here. My favorite book that I have read this year was Visions of Glory. I could not put it down!!!! I love historical books. A series I love is Prelude to Glory. It has been out for awhile but the Revolutionary War is always inspiring to me. I love “Evening Class” by Maeve Binchy. This is a book about people that come together in Dublin to take a class on Italian. It is great fun reading about all the different characters that take the class and their ultimate trip to Italy! Am reading the first book in The Inn Boonsboro Triology by Nora Roberts…very good with interesting characters and I was surprised to find out that the place actually exists along with the other retail shops in the book. May have to make a trip to Maryland and see them for myself! I read Carolyn’s story of “Escape” and gained great admiration for her. I wholeheartedly recommend this book! The Shoemaker’s Daughter by Adriana Trigiani! It tells about two young people from the mountains in Northern Italy who immigrate to the US around the turn of the century. It’s quite an adventure and you learn so much about what life was like then for Italian Immigrants in the US. For a YA read set in the same time period, I think your kids would like “Uprising” by Margaret Peterson Haddix- a great historical fiction novel about the fire at the Triangle Shirtwaist Factory. It also sheds light on what NYC was like for poor immigrants from Italy and Eastern Europe- as well as telling about the experiences of rich young society girls. I think you would love them both! Hmm…Diary of a Wimpy Kid? Haha, I need to get back into reading, I used to read a lot during school breaks but haven’t much recently, and those books were the very large in depth ones that get you hooked! That was just the only book on my mind that I remember reading and loving though it’s just comedic. Thanks for the giveaway! Brlinialce for free; your parents must be a sweetheart and a certified genius.